I somehow managed to stumble upon this page about residents in Denbighshire seeing strange lights in the sky over Moel Famau! That then led me on to the BBC page about Weird Wales and the strange sightings that walkers have seen. Although alien-like crop circles in the heather can be explained. How about you – have you witnessed strange happenings or had close encounters out on Moel Famau? Please tell me more! When Is A Hill A Mountain? As this Daily Telegraph article indicates, a hill is officially a mountain if it measures at least 2000 feet. 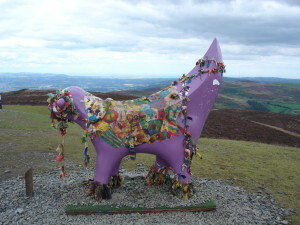 Moel Famau cannot therefore be classed as a mountain because at 1818 feet it falls short by 182 feet. So it’s a rather big hill then! The Evening Leader reports that countryside campaign Heather and Hillforts is aiming to offer visitors to Moel Famau their own personal guided walk via their mobile telephones or by downloading the free mp3 version from the web, to help them explore the area’s fascinating past through the ‘Heather and Hillforts’ project. The trail, which will be launched this autumn, will give visitors the opportunity to walk through Moel Famau Country Park up to the Jubilee Tower with a number of experts to hand. The tour includes accounts from archaeologists and nature experts to name but a few, and gives visitors the unique chance to be shown around this fascinating area by the people who live in it, work in it and love it. We were also able to talk to a gentleman who visited the area from the Wirral as a young boy scout in the 1950s and now lives in the area. It is fascinating to hear of his memories, of getting the bus, camping at local farms and walking up to the Jubilee Tower with his friends. It is great that we have been able to record these unique accounts and can now archive them as a first hand oral history account, which otherwise would have been lost. The mp3 files and numbers for the mobile downloads will be available in due course. We’ll let you know when they’re available.